You can fill out an adoption application online on our official website.Playful & Smart! Looking for your next BFF? Look no further. 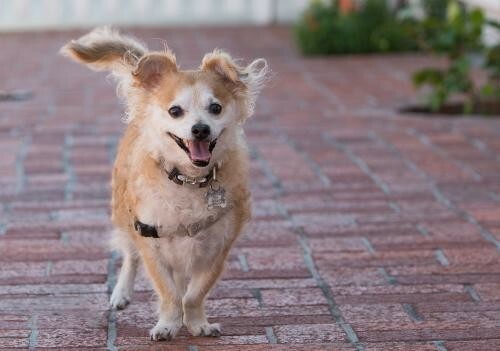 Waffles stands by his name in being a sweet and loyal companion. You can count on this guy to be there for you when you want to play ball, cuddle on the couch or teach a trick. He is incredibly smart and loves to please! Prior to adoption, all dogs/puppies are spayed/neutered, tested for heartworm, vaccinated (including rabies, if age appropriate) and microchipped. Adoption fees for dogs/puppies: http://www.svpetproject.org/info/adoption Stay up-to-date on what Waffles is up to by following us on Facebook! Visit this organization's web site to see any additional information available about this pet. Silicon Valley Pet Project works to save local at-risk shelter pets by engaging the community and by using innovative and sustainable business practices. Are you interested in meeting one of our available animals? Please fill out the appropriate online application on our website. We will be in contact with you to arrange a meeting with the rescue pet you are interested in. Please note that all of our rescue pets are in private foster homes and meetings will be coordinated with foster parents. Typically, after you meet the rescue pet, we will follow up with you to see how the meeting went. If a match is made, we can finalize the adoption quickly. Please note that we may require a home check as part of the application process. Thank you for your interest in our rescue pets! Adoption fees are between $100 - $400 depending on animal, breed, age.